To verify that the angle subtended by an arc at the centre of a circle is twice the angle subtended by the same arc at any other point on the remaining part of the circle. A circle is a set of points which are all a certain distance from a fixed point known as the centre. 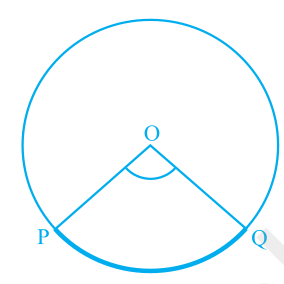 A line joining the centre of a circle to any of the points on the circle is known as a radius. The circumference of a circle is the length of the circle. The circumference of a circle = 2 × π × the radius. The following is a recap of terms that are regularly used when referring to circles. Arc: An arc is a part of the circumference of a circle. Chord: A chord is a straight line joining the ends of an arc. Radius: A radius, r, is any straight line from the centre of the circle to a point on the circumference. Segment: A segment is the part of the circle that is cut off by a chord. A chord divides a circle into two segments. Angle Subtended: In geometry, an angle subtended by an arc, line, or other curve is one whose two rays pass through the endpoints of the arc.